The Lytro light field camera isn't like other cameras. It captures information about how the light rays are travelling - their direction, colour and intensity - so that you can refocus your images after you've taken them. The ability to change the focus of your photos after the event may sound like magic, but it's actually down to an array of microlenses placed over the sensor which scatter the light according to the angle of its approach. The clever camera then uses this information to work out where the light would've ended up, if the focus was slightly different. The result of this nifty tech is extraordinary although inevitably, image resolution suffers slightly as a result. Since Lytro first introduced the camera in 2012, it's added a few goodies, not least Perspective Shift. This enables you to interact with the photo and change your point of view, albeit by very small degrees. Instagram fans will also be pleased to hear that Lytro has introduced Living Filters - an selection of the usual arty filters for giving your pictures a retro look. We've seen a few quirky camera trying to do something different over the last year or so - step forward, Canon Powershot N - but has the Lytro got what it takes to succeed? To maintain the minimalist look, it has very few controls. There's a power button on underside, next to a hidden mini USB port, while the top is home to a central shutter release button, plus a discrete zoom slider that runs across the nose of the camera. The main camera itself sports a slick anodized aluminium finish, while the front section nearest the lens is rubberised for a bit of a grip. The only other physical feature you'll find is a small indent to feed the supplied wrist strap through. It takes a while to get used to holding the camera and not moving it when you're taking a snap, but it's certainly easy to use. 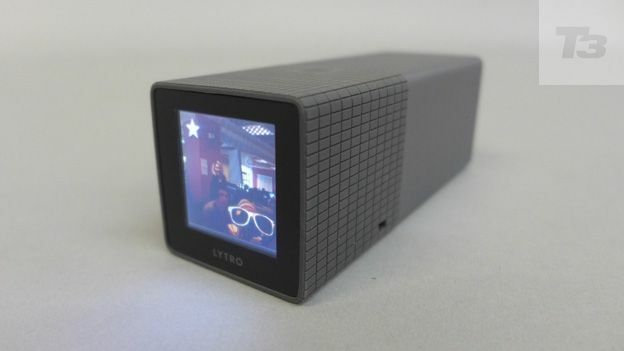 There are two versions of the camera available - the standard model has 8GB of memory, which Lytro says will store 350 of its 'living pictures', while the 16GB model will hold 750 pictures. The camera sports a 4.6 x 4.6mm along with a 43.344mm (35mm equivalent) lens with a fixed f/2 aperture and an 8x optical zoom along with an ISO range of 80-3200. The camera also packs built-in Wi-fi so that you can upload your snaps. Lytro tells us that while Wi-Fi capability wasn't active on the first wave of products that we saw in 2012, the technology was always there - it was just laying dormant waiting for a software update, which has now arrived. The tiny 1.52-inch LCD touchscreen sits on one end of the camera and you can tap the screen to refocus while taking shots. To review your snaps on the tiny screen, you swipe right and then scroll through your shots before pressing the shutter button to go back to shooting mode. You can tap the onscreen star to choose your favourite snaps - these will be imported first when you transfer your pictures. While the screen on most conventional cameras is a handy tool to check your shots as you go, the Lytro's is so small that you can't really tell if you picture is any good until you've uploaded it to something with a bigger screen. The Lytro has two shooting modes - Everyday and Creative. The Everyday mode means that you don't need to focus each shot - you just point and shoot. If you want a bit more control, then the Creative mode, enables you to control the blur in the shot by tapping the screen to choose what to focus on. You can also use the manual controls to select the shutter speed and ISO level. Once you've got your shots, you can upload them to your computer by hooking up the camera with a USB cable. The first time you do this, you'll be asked if you want to install the free desktop software (you can also download it from the Lytro website). Alternatively, you can upload to your online Lytro gallery - you can either sign in through Facebook or create a new login. You can upload over Wi-Fi via the free Lytro Mobile App for iPhone and iPad (there's also an Android app planned which Lytro hopes to launch by the end of 2013). Images can be shared to Facebook as animated GIFs either from the app or from your online Lytro gallery or the desktop software. This works reasonably well and the pictures can be viewed (and the point of focus altered) easily on the desktop version of Facebook. However, we found that when viewing these on mobile versions of Facebook, the picture wasn't actually visible on the timeline and instead the link directed us to the Lytro website. There's also no way of tagging friends in the picture, or in the caption that you can add when uploading it. As well as uploading to Facebook, you can also post to Twitter and create a GIF of your image (you'll have to choose between the refocus feature and Perspective Shift for the latter). Because the LFP (Light Field Picture) files are pretty big, it takes quite a while to convert and send each picture. The '11-Megaray' sensor produces images of around 1080x1080 pixels and while the camera shoots images at 11MB, the pictures that you share will only be around 1.2MB in size. The technology involved means that there's an inevitable loss in clarity, so a lot of the images we ended up with were rather soft. The Lytro works best on shots with plenty of depth involved to get the full effect of the shiftable focus. This takes a lot of getting used to, as you have to completely relearn what you know about taking photos. The lack of flash is slightly limiting - you'll need to shoot in relatively bright conditions, or use an independent flashgun, or the flash on your compact or smartphone. While the ability to refocus your image after you've taken it is extremely cool, the quality of the image itself is nowhere near what you'd get from a quality compact like the Canon Ixus 510 HS, Panasonic LX7 or the Sony RX100. However, when you manage to get a shot with plenty of depth that can be refocused at will, the result is pretty remarkable. For innovation, and sheer audacity, we love the Lytro light field camera. The technology involved is extremely impressive and we also like the design of the camera itself. However, the whole experience needs some polishing While the design is chic, the tiny screen is simply too small for composing and reviewing shots. Uploading the pictures is pretty sluggish, and the social media sharing also needs some fine-tuning. Niggles aside, this is only the start for Light Field cameras and we look forward to seeing what the boffins at Lytro come up with next.